The Kalaydjian Foundation was founded in 1984 by brothers Bedros and Aram Kalaydjian, in Larnaca, Cyprus. Aram Kalaydjian was born in 1936 in Larnaca and graduated from the American Academy, following which he joined the family business of textiles and real estate. He served as Armenian Representative in the Cypriot Parliament from 1982-1995, being elected to that post three times (in 1982, 1986 and 1991). He was Chairman of the Larnaca Chapter of the AGBU from 1968-1976 and of the Cyprus Chapter from 1976-1995. 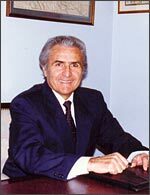 He was also Chairman of the Melkonian Educational Institute from 1976-1995. He was instrumental in passing through the Cyprus Parliament two resolutions – in April 1982 and in 1990 – condemning the Armenian Genocide of 1915, the latter resolution declaring 24 April as a National Remembrance Day of the Genocide in Cyprus. In 1986 he was made an honorary citizen of Beirut in recognition of his assistance to Lebanese refugees during the civil war in Lebanon. In 1990 he was appointed Honorary Consul-General of the People`s Republic of Bangladesh in Cyprus, a position still held by his family. Following his death in 1995, the Municipality of Larnaca named a street after Aram Kalaydjian.